WASHINGTON, DC, October 18, 2015 (ENS) – “In light of current market conditions and low industry interest,” the U.S. Department of the Interior says it will cancel the two potential Arctic offshore lease sales scheduled under the current five-year offshore oil and gas leasing program that ends in 2017. 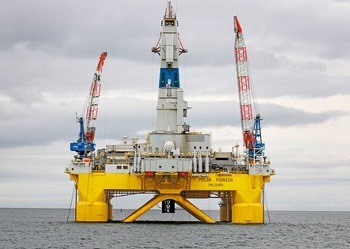 In response to calls for interest in two lease offerings, one in Chukchi Sea and one in the Beaufort Sea, the Bureau of Ocean Energy Management, BOEM, said it received only one application from the oil and gas industry. “In light of Shell’s announcement, the amount of acreage already under lease and current market conditions, it does not make sense to prepare for lease sales in the Arctic in the next year and a half,” said Secretary of the Interior Sally Jewell. “I am proud of the performance of Interior’s Bureau of Ocean Energy Management and Bureau of Safety and Environmental Enforcement, the U.S. Coast Guard and others in ensuring that Shell’s program this past season was conducted in accordance with the highest safety and environmental standards,” said the secretary. Shell said it would seal and abandon the well in accordance with U.S. regulations. The Bureau of Safety and Environmental Enforcement also denied requests from Shell and Statoil for lease suspensions, which would have allowed the companies to retain the leases beyond their primary terms of 10 years. American Petroleum Institute Director of Upstream Erik Milito blames the Obama Administration for undermining development of “vast offshore oil and natural gas resources in Alaska” with its “regulatory and permitting unpredictability and uncertainty. But conservationists declared victory after their long-standing and ongoing campaigns to end oil development in the fragile and rapidly warming Arctic. “Today’s announcement marks a significant step in the right direction, but it is disappointing that current market conditions and lack of industry interest, not a safe climate future, moved the administration to action,” Knodel said.